Everyone has had a bruise at some point in their life. Bruises occur when the blood vessels by the skin's surface break. This lets a small quantity of blood leak into the tissue underneath the skin. The trapped blood causes a bruise that begins black and blue but changes color while healing. As long as your skin hasn't broken, you don't need to put a bandage on it. You can, however, learn the ways to make a bruise go away more quickly and speed up the recovery process. As soon as you notice the bruise, take some time to apply ice. It will minimize skin discoloration and reduce the amount of blood that pools. You just need a clean cloth and some ice cubes, ice cold water, or an ice pack. Wrap ice cubes or an ice pack in the cloth before you put it on your skin. If you are using ice-cold water, wring excess water out after soaking it. Place the cold object on the bruise for 8 to 10 minutes. Wait at least 20 minutes before reapplying it. Do this two or three times. Wait two hours before repeating the process. You can use an elastic bandage to wrap your bruised area. This will squeeze tissues under the bruised skin while preventing blood vessels from possibly leaking. Be sure not to wrap it too tightly as it can lead to inflammation. Loosen the bandage if pain increases or you notice coolness, swelling, tingling, or numbness. A good way of learning how to make a bruise go away is to keep it elevated during the first 48 hours. This reduces blood flow to the area so less blood pools there. If you are lying or sitting down, use cushions to elevate your hands or legs. Do your best to keep the bruised area at the level of your heart or higher. After the bruise has been there for 24 or 36 hours, you should start gently rubbing the area. Gently massaging the bruise a few times a day can encourage your body's lymphatic process to help clear away pooled blood. Rub the area gently without applying pressure. Don't rub it if it is painful to do so; instead, wait and try again in half a day or so. Heat can improve circulation by the bruise, helping clear the pooled blood. Always wait a minimum of 48 to 72 hours after getting bruised to apply heat. Applying it too soon will cause more blood to pool, worsening the bruise. You can use an electric heating pad for 20 minutes at once. You can also try a warm compress made by heating a clean cloth or a hot water bottle. Sunlight is an easy way of applying heat to a bruise to clear it up faster. UV light is one of the ways of how to make a bruise go away because it breaks down bilirubin which is the hemoglobin breakdown product that turns bruises yellow. By exposing the bruise to sunlight, you speed up the rate at which this bilirubin breaks down. Just remember not to stay in the sun too long. Aim for 10 to 15 minutes at a time. 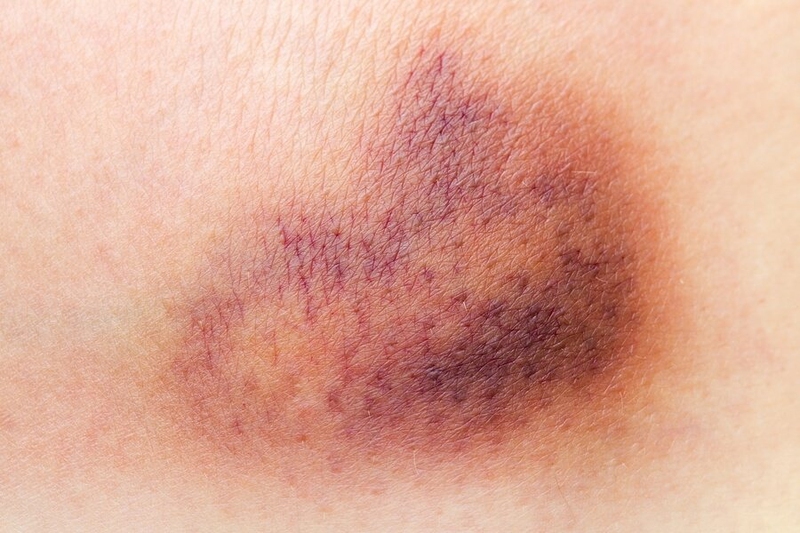 A vinegar compress can also help make a bruise disappear by increasing blood flow to the area. Mix ¼ cup of vinegar in 2 or 3 cups of warm water. Then, soak a cotton ball, gauze pad, or wash cloth in the solution before gently rubbing the bruise with it. Comfrey is another easy home remedy for bruises. Just be sure never to use it on a bruise by broken skin. You can use comfrey in a compress or poultice. For the compress, steep 2 tablespoons of dried or 4 tablespoons of fresh comfrey leaves in 2 cups of boiling water for 10 minutes. Strain it (don't drink this) and then soak a washcloth or gauze. Apply it to the bruise for an hour. To make a poultice, clean some comfrey leaves and mix it with just enough warm water to grind the herb in a food chopper or blender. You want to create a thin paste. Thicken it using rice or wheat flour then spread it on gauze or cloth. Cover this with more gauze or cloth, creating a sandwich with comfrey between gauze or cloth. Apply the warm poultice on the bruise for 30 or 60 minutes. You can also use this as a cold poultice. Witch hazel is good for bruises as well as burns, sprains, and varicose veins. Its astringent properties stop blood from leaking within the blood vessels. It also quickens healing by stimulating lymphatic fluid drainage from the area by the bruise. Soak a cotton pad in a witch hazel tincture or lotion. Apply it on the bruised area for several minutes two or three times daily. A final home remedy of how to make a bruise go away is arnica. Put ¾ cups of dried arnica flowers in a crock pot or double boiler. Add 2 cups of coconut oil and stir so the herb is submerged. Let it infuse for 12 to 24 hours on low heat. Stir this frequently and make sure the arnica is submerged. After the time is up, turn off the heat, letting the mixture cool for about an hour. Cooling too long will solidify the coconut oil. Use a cheesecloth to strain the arnica mixture in a bowl. Put the filtered oil back in your double boiler on low heat. Add ½ cup of beeswax granules and whisk to dissolve them. Once it melts, take it off the heat, letting it cool for an hour. Store the salve for use whenever you need it, but don't apply it to broken skin. You should see your doctor for a bruise if there is very painful swelling in the area or you still feel pain after three days. Also see your doctor if there are frequent painful or large bruises, particularly on the face, back, or trunk without a known reason. You also need to see the doctor if you notice a lump on the bruise, have a history with significant bleeding, bruise easily, have other abnormal bleeding, begin suddenly bruising without a history of it, or have a family history involving easy bleeding or bruising.